Adventures in the Endless Pursuit of Entertainment: The Pipes of Christmas are calling! The Pipes of Christmas are calling! We are just weeks away from the annual Pipes of Christmas. It's the best holiday celebration in New York City, and this comes from a cynical soul who has all but given up on Christmas. It also stirs up my wee dram of Celtic blood and makes my soul soar! I plan my entire December around the Pipes of Christmas concert. In New York City, the concert is at Madison Avenue Presbyterian on December 14th at 2 and 7 pm. On Sunday the 15th, the concert is held at Summit, New Jersey. Tickets are available via Smarttix online or by calling (212)868-4444. 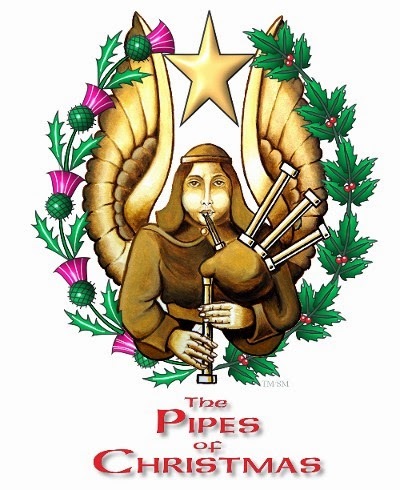 The Pipes of Christmas is presented by Clan Currie and is in its 15th year. It's a joyous event that also raises funds to support music scholarships for educational institutions offering Celtic music programs, including the Royal Conservatorie of Scotland, the Gaelic College of Arts, and the National Piping Centre. The traditional and spiritual concert features music and readings from the Celtic ancestry of Scotland, Ireland and Wales. Features performers include James Robinson ("Braveheart"), New England fiddle champion Paul Woodiel, "Riverdance" uilleann piper and flutist Christopher Layer, Gaelic Mod champion harpist Jennifer Port of Golspie, Scotland, and the Pipe Major Kevin Ray Blandford Memorial Pipe Band from Redlands, CA. The concert will also debut composer Steve Gibb's "Lullaby for a Prince," specially commissioned to mark the birth of HRH Prince George of Cambridge. Gibb, of Inveness, Scotland, debuted his beautiful composition "Balmoral Snow" in honor of HM Queen Elizabeth's Diamond Jubilee at last year's Pipes concert.